**PROUDLY MADE ENTIRELY IN THE USA. 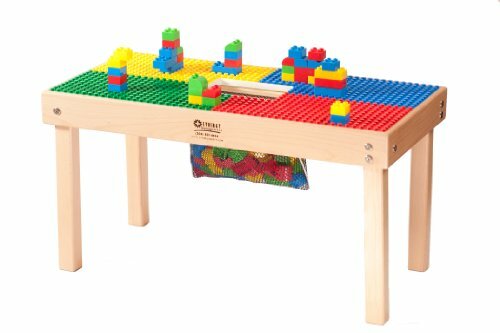 **Encourage your child's imagination with the Duplo Compatible Fun Builder Block Wood Table. **Built in Mesh Storage Bag(patent) keeps blocks contained within the table and not scattered all over the floor like other table designs. **PREASSEMBLED so only the legs need to be fastened in the table frame. ** Building Blocks are not included with the table. **OPTIONAL WOOD PLAY COVER- ORDER #TC16 **"FOR AGES 1 TO 5"
Built-In Heavy Duty Mesh Block Storage Bag keeps blocks contained within the table and not on the floor! Dimensions: 32"L x 16"w x 18"H MADE IN USA! !